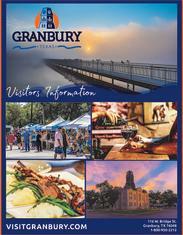 The Visit Granbury, Inc. team is committed to delivering the brand promise of promoting Granbury as an idyllic destination for every traveler. We work with local, regional, national and international journalists distributing press kits, hi-res images and news releases. We also have created specialized targets and story-starters covering virtually every tourism component/angle, and we host media familiarization tours. For assistance with story ideas or travel itinerary, please complete the form and one of our staff members will be in touch.